Order Maps - Tucson & Vicinity - Projected Population Change: 2004-2009 - Maps & Facts Unlimited, Inc. Displays the projected change in total population within each block group as reported by ERSI Business Information. 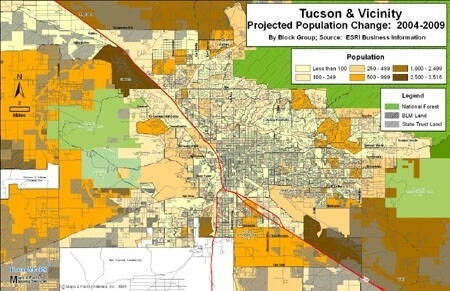 Maps & Facts Unlimited, Inc.
6830 N. Lost Dutchman Dr.